It’s a facility owner’s worst nightmare. Last night, the news covered a possible storm headed your way. Rain and hail were in the forecast, but the strong winds were not. After a tree falls on part of your facility, the power cuts out and dangerous chemicals spill. Now, in the heat of the moment, you must evacuate your employees. How do you alert your employees to the disaster on the other end of the building? How do you get everyone out safely? How do you account for all personnel? At this point, you must implement your emergency action plan (EAP). Before the storm is even a twinkle in your eye, you must have an EAP in place in order to know what you must do to evacuate the building and get your employees out safely. Your EAP must be able to tell you and your employees when an evacuation is necessary and what the routes and exits are. The type of facility in which you work may be a factor in how you decide where employees should evacuate. It’s your job to imagine worst-case scenarios and plan escapes for them accordingly. Employees should know how to respond differently to different threats. For example, if that storm had brought a tornado instead of high winds, you would have had your employees hunker down in a structurally sound area in the workplace instead of fleeing the building. An alert system must be put in place to warn employees when there is an emergency in progress. Your employees must know when to evacuate and recognize the emergency alarm as a signal to evacuate the work area or perform actions identified in your plan. The alarm must be audible and visible over the noise that occurs during an average workday. It’s a good idea to consider installing an auxiliary power supply in the event that electricity is shut off. Touch-sensitive devices should be used to alert employees who would not otherwise be able to recognize the audible or visual alarm. Unlikely to expose those evacuating to even more hazards. Maps of the floor plan of your building must show the evacuation routes and must be placed throughout your facility for all employees to see. Evacuation procedures, routes, and exits should never be a secret! How will your employees know where and when to leave if you are not explicit in telling and showing them? Many employers choose to appoint an individual within the facility to be the emergency coordinator. The coordinator will assess the situation in order to determine if an evacuation is necessary. This person will implement the EAP by supervising the emergency situation, working with outside emergency services (i.e., medical aid, fire, and police services), and directing the shutdown of plant operations if required. During your emergency, make sure you stay informed with outside emergency personnel and follow instructions. In addition to the coordinator, you may want to appoint an evacuation warden to help move employees from danger to safe areas during an emergency. In general, one warden per 20 employees should be enough. Wardens may check offices, bathrooms, and other spaces before being the last one to leave the area. 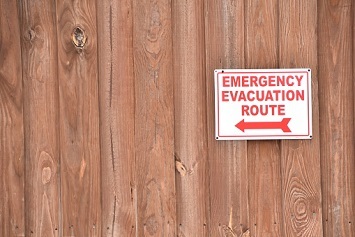 Appointed emergency evacuation leaders should be well-trained in the complete workplace layout and alternative evacuation routes in case one exit is blocked. Confusion after an evacuation can lead to unnecessary and risky rescue operations. The more organized you are with your evacuation planning, the more lives you will save.